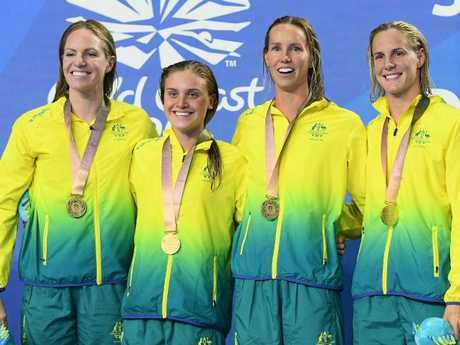 AUSTRALIA has notched a grand slam of six relays to finish its Gold Coast gold rush with 73 medals in its most successful Commonwealth Games swimming campaign in history. 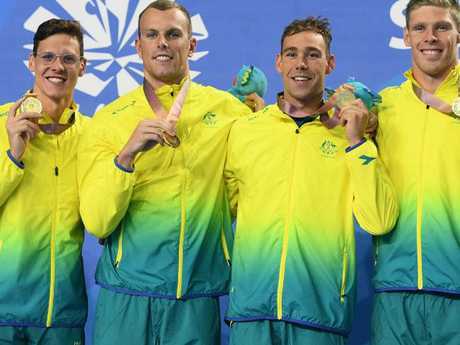 Kyle Chalmers anchored Australia's men to victory in the medley relay to give Australia a tally of 28 gold, 21 silver and 24 bronze in the Dolphins' best effort since they won 25 gold at Victoria, Canada, in 1994. That team included some of the greatest names in swimming history, including Kieren Perkins, Susie O'Neill and Sam Riley and while a direct comparison is difficult given the addition of 50m form strokes and para events, there are strong signs for Australian swimming moving forward. Mitch Larkin finished with five gold medals in an outstanding comeback after a rollercoaster period following the high of his 2015 world championship success. "This is pretty special tonight," Larkin said of his relay win. "You put on the tracksuit and it means a lot more than racing for yourself. "You race for a lot of the people at home, for these three guys. "It's nice being a backstroker I can get my job done and touch the wall and cheer on these guys." Larkin may have had just over 90 minutes between his victorious 200m individual medley win but his lead-off leg in the relay gave the Aussies the lead they needed before English world record-holder Adam Peaty hit the water in the breaststroke. Breaststroker Jake Packard could not hold off the great champion but did enough to put Grant Irvine in the water in touch. Irvine has had a heavy program at these Games, swimming three individual events and when he started losing ground on James Guy, Chalmers was left with a mighty task to overhaul Ben Proud, who was searching for a second gold after winning the 50m freestyle earlier in the night. Chalmers' trademark is his withering back-end speed but he went out so hard after Proud there were fears he would have little left in the tank. "I probably expected to be a little closer in the last 25m, I know Ben is a 50m freestyle specialist and I was hoping maybe he would start to burn out a little bit," Chalmers said. "It didn't start to happen. I had to put my head down and get to the wall. I knew it was going to be close." Bronte Campbell snared the most talked-about anchor leg at these Games, Australia going with the 100m freestyle gold medallist rather than sister Cate despite the older Campbell's history-making split on the opening night of competition. And she showed she was deserving of the honour, reeling in rising Canadian star Taylor Ruck to maintain Australia's relay record after turning in a blistering split of 51.57sec to snare her third gold of the meet. "It's really intimidating when you see them coming in together, but I was just focusing on Em (McKeon), she gave me a really good finish to get off," Campbell said. "I just tried to bring it home at the end and we managed to. "I'm so proud of the whole team." The win, after her victory in the 50m backstroke, gave Seebohm her 15th Commonwealth Games medal, equalling the record of Susie O'Neill. "This will probably be my last Commonwealth Games, so it is exciting to finish here on the Gold Coast and to finish on a high with these girls," she said.